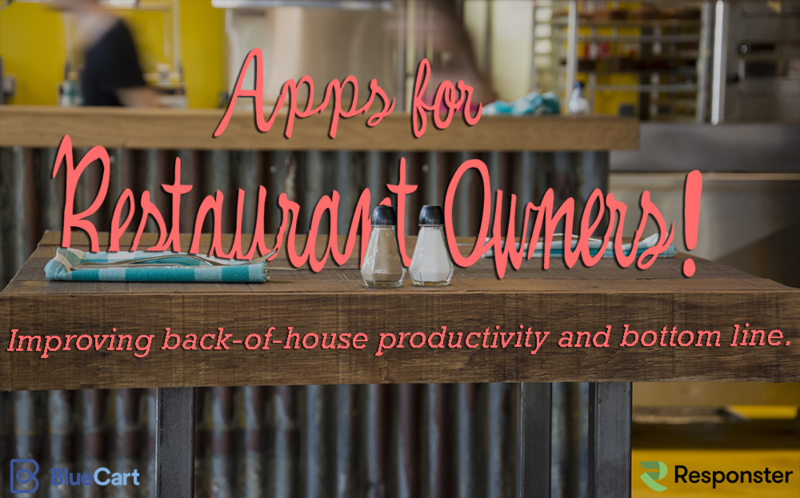 Apps for Restaurants - Improve Back of House Productivity! This is a special guest post from Matthew Katz, a Marketing Associate at restaurant app startup BlueCart.com – thanks for the contribution! Pull out your phone and search the Google play or Apple app store. Scroll through until you find the food category. Now think about what’s actually there to download. It seems there’s an app for everyone now, right? Your computer and phone can both be stocked with applications that allow restaurants to take reservations, let customers order food for delivery or carryout in a matter of seconds, give feedback on their dining experience and earn points through branded loyalty programs. Even if you spend some serious time scrolling, however, you’ll be hard pressed to find apps specifically built for restaurant managers, ordering managers, or chefs – the other side of the equation. Why is that? Is it because there are no apps to help these positions? That’s actually not true (you’ll learn that as you read this post). The apps you see on your phone or computer deal largely with the front of house, mostly because tech-obsessed consumers who go to restaurants are a bigger and more obvious market than the back of house staff who run them. In an industry where margins are razor thin, it’s understandable that restaurant managers and owners would put an emphasis on getting more and more customers in the door, rather than assisting those behind the scene. Can you blame them? It’s widely known that most restaurants fail within three years of their conception (although this blog post may offer a reprieve). So it’s no surprise that restaurateurs are employing technology to their advantage, especially in the front of house where employees interact with customers face to face. What is surprising is that these same restaurateurs aren’t applying cost-saving technology to the back of house. Think of each time someone receives a meal at a restaurant as a Broadway show. A Broadway show is meant to provide entertainment, and leave the viewer satisfied with the money they spent. The same can be said about a dish a chef produces that incorporates the finest elements and ingredients. What isn’t seen by the consumers is the immense amount of planning, work, and effort that takes place in creating such a play or dish. The amount of time in preparing the meal or the people who prepare it often goes overlooked. While the back of house for restaurants doesn’t have the all the bells and whistles of front of house, it’s still the backbone of the food industry. The back of house provides the workforce for meal creation. If you observe the back of house, you might see servers rushing back to get food, dish washers ensuring squeaky clean plates, and chefs preparing their meals all call the back of house their domain. Why should restaurateurs care if that group have access to great technology? It’s a pretty simple answer: Because that group greatly affects your bottom line. Employee scheduling is a necessary task for any restaurateur to oversee. The outdated way keeping track of employee’s schedule by putting a calendar in the office isn’t going to cut it anymore. Employees are known to switch shifts at the eleventh hour or in the worst case, not show up. As a restaurant owner, that throws the whole day off. There are multiple employee scheduling software systems out there, many of them incorporating great capabilities that include allowing restaurant owners to see who is working each day at each location. One of our favorite employee scheduling apps is WhenIwork. The scheduling software allows you to view the entire schedule or you can view schedule by location or position. WhenIwork offers a feature that notifies you as soon as an employee says they can’t cover a shift, and offers the scheduler an opportunity to reach out to all employees who could cover that shift. No more having to call or text your whole contact list looking for a replacement! A look at the Blue Cart app. Another issue that restaurants have is their process of ordering their supplies. It’s incredibly inefficient to email your produce supplier, text your alcohol representative and fax your meat provider. Not only does that waste an outrageous amount of time, but it also allows for a greater chance of miscommunication. There is an easier way that the ordering process can be done and it’s through BlueCart. The web and mobile based communication platform allows Chefs, operation managers and restaurant owners to place all their orders in one click, saving time and ensuring less returned orders. BlueCart allows restaurants to have a digital paper trail of past orders, enabling a way to double check and reference orders, and that fosters a better relationship between restaurant and supplier. The last back of house issue that can be solved with technology is ensuring that your food is safe for your customer. The hot button issue this summer was food safety (due to a major chain dealing with a food safety issue). Restaurants, both small and large, saw first hand what bad judgment and negligence in food safety can do. Revenue for the chain plummeted and the amount of bad press was massive. A startup called Ancera is the most recent food safety startup to get a huge amount of funding. Ancera uses a software device to comb through food to find cells that carry containments such as salmonella in a matter of 8 hours. Sure, back of house apps may not be on the first page of the android store or on the top 100 of food apps in the apple store, but that doesn’t mean they don’t offer major assistance, or that they aren’t worth the download. What tools have you found to help you in running your business? Leave a comment below!